Drought Threatens To Drive Famine In Somalia As Hunger Kills More Than 100 : The Two-Way On Saturday, Somali Prime Minister Hassan Ali Khaire said 110 people died of malnourishment or disease in a single region over a two-day span. About half the country is at risk of famine. A 5-year-old child cries as a nurse struggles to find a vein for an injection at a health clinic last month in Shada, Somalia. The child's family lost all their animals to drought and traveled more than 100 miles in search of a better situation. At least 6.2 million people in Somalia — or just about half the country — are grappling with the prospect of an acute food shortage due to deepening drought. And on Saturday, Somalia's prime minister made it clear that the conditions are exacting a stark human cost. "I can confirm that Bay region in the south and other parts of Somalia are deteriorating rapidly," Khaire said, "and my estimation is that half of the country's population has felt the impact of this drought." As NPR's Eyder Peralta notes for our Newscast unit, the country already declared the drought a national disaster on Tuesday. As Somalia has dried up, Khaire says the lack of clean water has increased the risks of waterborne diseases, while the ability of malnourished people to fight off those diseases has plummeted. "It is a difficult situation for the pastoralists and their livestock. Some people have been hit by [hunger] and diarrhoea at the same time," Khaire's office said in a statement. "The Somali government will do its best, and we urge all Somalis, wherever they are, to help and save the dying Somalis." The United Nations is putting out urgent calls for aid, saying as many as 5 million people need aid in the shadow of a looming famine, according to The Associated Press. "Thousands have been streaming into Somalia's capital, Mogadishu, in search of food aid, overwhelming local and international aid agencies," the news service reports. "Over 7,000 internally displaced people checked into one feeding center recently." 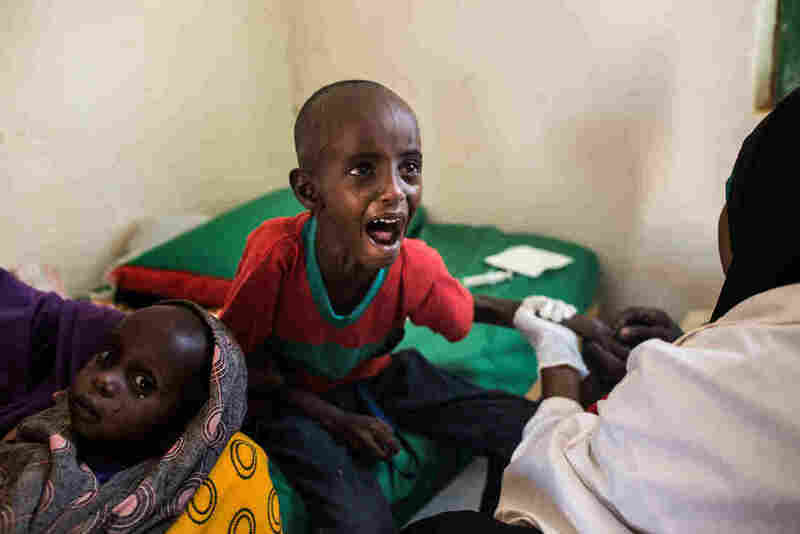 If a full-blown famine should descend on Somalia, the World Health Organization says it would be the country's third famine in a quarter-century — and the second in less than a decade. Citing a joint report by the U.N. and the United States Agency for International Development, CNN reports that famine killed about 258,000 people in Somalia between 2010 and 2012. But famine is not yet a foregone conclusion. The AP reports the U.N. is currently appealing for $864 million in humanitarian aid, while "the U.N. World Food Program recently requested an additional $26 million plan to respond to the drought."